Tired of vocal lessons that don't work? There are not many vocal mistakes you could make that I haven't made. In my career as club singer, session singer, jingle company staff singer, songwriter, MTM Records artist and stage performer I have sung in about every situation you can, performing in choirs, clubs, home studio vocal booths, major recording studios, national television shows and venues from state fairs to amphitheatres. I know what it feels like to not have the voice you need for the song you are about to sing. Just like you, I have experienced vocal strain, range limitations, pitch problems, and vocal damage. For a professional vocalist, these issues can seriouly threaten a career. The last person I recommended your PPP CDs to blew everyone away in the studio with the change in him before and after he studied your course! Studying under professional vocal coach Gerald Arthur showed me how important vocal training can be. After working with him I had a #1 record and won ACM New Vocalist of the Year. Asked by several singers to help them hit notes they where having trouble with, I began teaching voice myself. Eager to become a better teacher, I began studying the art of vocal training from every source I could find. I read books and studied cds, I talked to doctors, chiropractors and nutritionists. I gained insights from working with every student. I tested EVERYTHING with one criteria: Does it WORK ? A few years after I began to teach, I began noticing that everything I knew about the voice would fit within three major catagories: Breath issues, Throat issues, and Performance issues. And- I noticed they affected each other. I put thes three cornerstones together with an imagery from a book by Jeffrey Allen- and Power, Path & Performance was born. Major music careers have been born, problem voices have been set free, and people have found voices they never knew they had from studying this method. You have been looking for it. 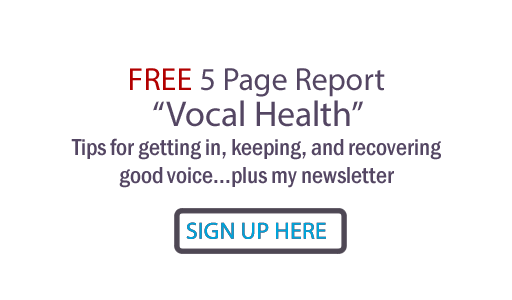 Your voice deserves the synergy of "Power, Path and Performance " - vocal training that WORKS! 1. The condensed 1-CD course sells for $19.99 (plus shipping if physical CD). This small but packed course takes you through assessing your vocal strengths and weaknesses, introduces you to the "Power, Path and Performance" method, and gives you a vocal warm up. BREAKING NEWS: 6- disc package now includes 2017 update of 6th disc! 1 hour video DVD of vocal exercise demonstrations - including new exercises! AND: Digital download and thumb drive options are now available! Contact Judy for information on direct payment for digital and thumb drive purchases. Judy- Thanks so much for your programs! 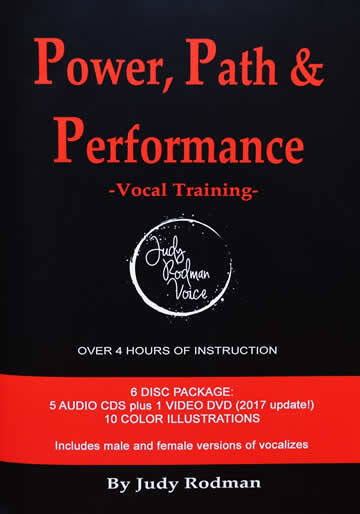 I have the Power, Path & Performance program and it has transformed my voice in only 2 weeks!! Wait ’til we see another 2 months!!! Soo excited for your newsletters and for continuing my vocal education with you. “Power”: Breathe correctly, understand your voice’s “engine” and sing with extraordinary control, strength and volume. 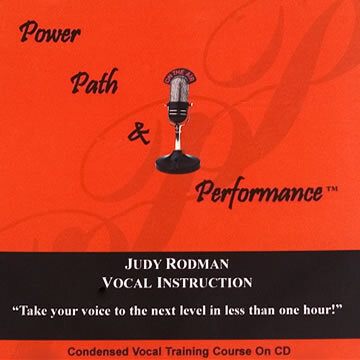 Judy Rodman's vocal techniques have changed my life. There isn't another person that has affected my musical career more than her. Power, Path & Performance CDs are working great … best investment I ever made! Special thank you to Mr. Jeffrey Allen of Van Nuys, Calif., for allowing me to use his concept “Voice Path.” I highly recommend his books (Secrets of Singing). . Many thanks to Dr. Dwaine Allison, chiropractor. He not only has literally “straightened me out”, but has been an invaluable resource to me on anatomy, pressure points, nerve issues and the value of subtle anatomic manipulation as used in the Feldenkrais and Alexander methods. I also thank Alexander practitioner Ethan Kind for his invaluable information and suggestions for making muscular effort more efficient for singers. I’m grateful to Dr. Charlie Ferguson, Dr. Robert Hubbard aka 'The Survival Doctor', Tamara Mariea PhD, CCN and founder of Internal Balance, naturopathic physician Dr. Eddi Kenny and natural health practitioner Lynne Lavers for their invaluable input on anatomic, nutritional and health issues of vocalists.